Earn Cash By Watching Viral (Youtube) Videos! - Freebies, Deals, & Cash! Earn Cash By Watching Viral (Youtube) Videos! If you haven’t heard of the Fam.ly app yet, you’re missing out! 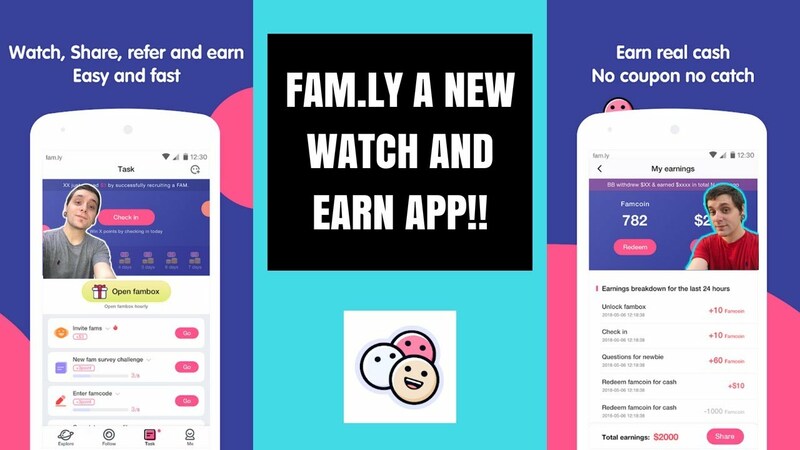 Fam.ly is a newer mobile app (available on Android & iOS) that allows users to earn real cash by interacting on the app & watching youtube videos! Some of the videos are the same videos you would see while scrolling through your newsfeed on Facebook! You can also earn daily JUST for checking in & having the app. 3.) and so much more! Every evening, you will see your “FamCoins” deposit into the “Wallet” section of the app. Your balance updates one time per day. Let those Famcoins build up, and you can redeem them, or cashout every month between the 1st & the 5th, Paid via Paypal! The Fam app is 100% FREE to join. You’ll never run into any kind of fees. Download & Sign Up HERE! Want more FREE Ways to make extra cash??? Go to the “Earn Cash” tab on our website to scroll through more sites/apps to earn extra money from home. All 100% Free & Legit!